It all started some months ago when my band came together for a rehearsal after a few years of doing other things ... I had sold most of my band stuff over the years - '81 Gibson les Paul Standard, '67 Gretsch Tennessean, Marshall top, Marshall 4x12" Cabinet - So I borrowed a guitar from a friend, got an amp from the studio where we practiced. But I just could not find my way around the Gibson. I had to work very hard; frets were to high, my fingers stick to the neck like glue - Everything I used to do on the old Tennessean was impossible on the new Les Paul. The rehearsal was great - stories - beer - old songs. We agreed doing this soon again. Late that night I went home on my bike. 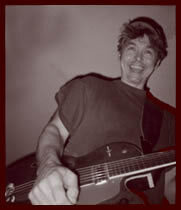 I decided to look for a new guitar - a new workhorse - one with a tremolo - if possible a vintage one. Over the next few days I visited a lot of guitar shops on the Internet - went trough a pile of adverts - man prices had developed quit a bit over the past few years. First I looked at Gretsches - old ones - Nice Tennessean ones - big bucks and way over my budget. I found a 1963 Fender Jaguar pre CBS - looked okay in the web advert - but when actually holding the guitar it was refinished (by hand!) in black - lots of it. Original L-neck plate was missing and the bridge had to be replaced. Probably that's why the price was not over the top ... but still asking price was close to 1700 US$. The only good thing about this Jaguar was its neck, it played like butter. Then one night I stumbled on the Internet over a Telecaster. Wow - this one had the looks - customized, with a Charlie Christian neck pick-up, Lindy Fralin Bridge PU and .... a B16 Bigsby tremolo. Description said: 50´s Butterscotch Blonde Special Danny Gatton Tele Super Lightweight one piece "reliced" Swamp Ash Body - Very nice USA Flamed One Piece Maple Neck - Kluson Single Line Tuners - Ultra rare 50´s Tele Bigsby Vibrato - Neck PU : 30´s Charlie Christian Gibson Jazz Box BAR PU (very warm and fat Blues Tone!) - Bridge PU: Lindy Fralin Vintage 50´s Telecaster PU that screams! - Aged 1952 Hardware. Over the next 5 days I was re-thinking my budget, placed several bids. But eventually I was overbid by someone with a much bigger budget - but by then my mind was set to build my own Relic Telecaster. I searched the Internet for information on the Danny Gatton Telecaster and found the info I was looking for on a German Guitar Forum where this guitar was on display in a gallery of a forum member. Here was where this Tele started life and was described what parts were used original. Before going on sale some of the parts were replaced for less expensive one's like the neck, which was original attached to a '54 Esquire. I bet other hardware also has bin replaced because this guitar would otherwise bin worth double the price. A few days later I stumbled over a Fender Bigsby Telecaster Complete Body from 1973 - Mahogany - Equipped with original Fender F-style Bigsby. All pick-up's & electronics installed - A perfect start for my project. In the coming months I will be adding new content to the website. Planning to add info on new topics I have been working on over past weeks. 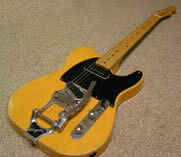 My restoration project of the ’73 Bigsby Telecaster is done, results and pictures you can view on page  of MyProject. I am working on a new topic: Telecaster Neck Dates. At the moment I’m collecting pictures of Tele Neck Date stamps. Why? You ask. Well I came across this ‘fake’ Fender Neck Stamp. I was looking for an early 7ties neck but when I saw that stamp I knew there are some who are replicating old necks and selling them for the real stuff. Hopefully this page will give some clues to see what is phoney and what is real. Let’s call it tele neck forensics. To give you an idea of this page you click pic of the the stamp on the right. It is the first sketch of the Tele Neck Date page. All pics of neck stamps will be of Telecasters. Most of the 6ties and early 7ties tele’s had a neck stamp so I have to collect some 15 years of stamps - which brings total close to 180 pics. That is a lot. Think I’ve collected 60 sofar, so it will be an ongoing project - if you have a picture of a tele neck stamp that isn’t in the page you can send them to me. I’ll place them on the page. Furthermore I’m thinking of adding a page with fake ‘old’ tele stuff that is sold for real and what to beware of. Upcoming is also the topic of ‘Relicing’. Want to go out for a search and look if I can fill a page with useful info on how it’s done on the different Telecaster parts – well this will keep me busy for a while - thanks Natsteel - July '05 .